You are at:Home»Herbs»Juniperus communis Linn. Latin name : Juniperus communis Linn. Description : The berry is analgesic, anthelmintic, antiarthritic, antibacterial, antifungal, antiinflammatory, antirheumatic, antiscorbutic antiseptic, antispasmodic, aromatic, carminative, constipative, cystotonic, demulscent, deobstruent, diaphoretic, digestive, strongly diuretic, emmenagogue, stimulant, stomachic and tonic. Beneficial to the digestive system, the female reproductive system and the menstrual cycle. Useful in scanty urine, hepatic oedema, cough, gonorrhoea, leucorrhoea, cystitis, dysmenorrhoea, amenorrhoea and premenstrual syndrome (PMS). 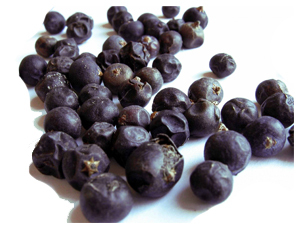 Juniper berry stimulates the flow of urine by increasing the glomerular filteration rate, the process by which blood and bacterial wastes are purified. This diuretic action is useful in such conditions as congestive heart failure, urinary infections, and kidney disease and helps to detoxify the body of harmful waste products that contribute to problems such as rheumatoid arthritis, swollen joints and cellulite. Juniper is also warming to the digestive system and increases the production of stomach acid, stimulates the appetite, settles the stomach, and relieves gas. Also useful in chronic arthritis, gout and bursitis. Recommended Dosage : 3 to 5 g powder of dried fruit. Contraindication : This fruit is not recommended if you are pregnant or breast-feeding. Use no longer than six (6) weeks at a time, since long term use may irritate the kidneys and urinary passages. Avoid in cases of heavy menstrual bleeding. Due to its action on the kidneys, Juniper should be avoided by those suffering from kidney disease.